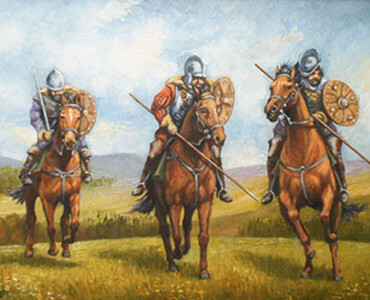 Who were the border reivers? 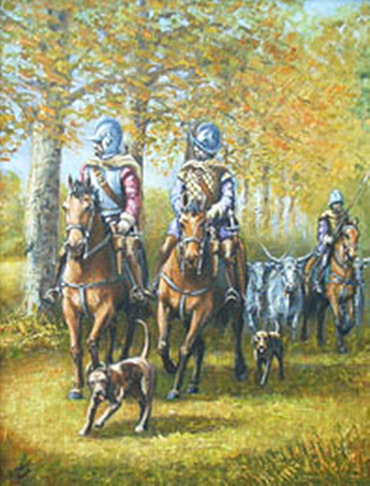 Were the Border Reivers truly evil, a band of murderers, thieves and blackmailers, or the legacy of an earlier time when the emergent nations of England and Scotland clashed in the surge for dominance of land and territory; when control of rivers, hills, valleys and estuaries meant much and people meant little? The story of what is now northern England and southern Scotland begins in medieval times and it is clear that even then the race for dominance was overriding. In the west the kingdom of Strathclyde Cumbria once stretched from the head of Loch Lomond, north of Glasgow, to include modern day English Cumbria and beyond. In the east the Angle kingdom of Northumbria had its southern confines on the river Humber and Edinburgh, far to the north, became its northern limits. The English Scottish Border Line. Both kingdoms were to lose their ascendancy as the Scots amalgamated with the Picts and eventually forced the Angles south of the Tweed at Berwick and the English kingdoms became subject to the forces of William 1 and 11 following the Norman invasion of England. Rufus, William 11, forced the Scots out of Cumbria and dictated that the river Esk was to be the Border between the countries. Destiny of the Border Reivers. The line of the English Scottish Border came at a great price to the people who were caught in the maelstrom of war and confrontation. Simple peasant farmers, they easily succumbed to the advance of marauding armies who lived off the land as they moved towards their dates with destiny. The people of the lands which surrounded the Border Line were to suffer every hardship, death, loss of loved ones and livelihood in the wake of armed and aggressive strangers. Rid the land of its people, soften its belly and it would be an easier catch! The English Scottish Border country became a virtual desert and those who survived the relentless onslaught must have often wondered if to live were the better option. No food or shelter and little prospect of either. The survivors had suffered greatly for their birthright. Vague reports, most uncorroborated, speak of cannibalism as far back as the days of William the Conqueror in his frustrating attempts to hold sway over Northern England in the 1070’s. His response to the Angle Kingdom of the north that would not dance to his tune was to kill the common folk, the providers of the meat and bread which sustained its leaders in their privileged lifestyle. As a result northern England was weakened and easy prey to the Scots who did, no doubt, exact a terrible vengeance on the people in the north of present-day England. The Border folk became a down-trodden mass of humanity with no hope of sustenance, living or future. The Fight Back of the Reivers. Those who survived the holocaust resorted to the only means at their disposal. They robbed where they could, be it from countryman, friend or foe existing in a similar dilemma across the Border. There is little in recorded history to substantiate that life was hell in the Border lands before the early 14th century. Medieval records are vague, prejudiced, some written long after the events they relate. It is true, however, to say that what is known speaks of war and confrontation in the surge for power and that the common folk suffered as a result. From the 14th century documented records exist which prove that the folk on both sides of the Scottish English Border agreed between Alexander 11 of Scotland and Henry 111 of England in 1237 were subject to every form of depravity. The nurture of both crop and beast became a distant memory. The Borderers fought back. They became the Border Reivers.